Brush up on your astrophysics. If I had to man a spacecraft with different species of astronauts, I'd probably go "actual person," "sign language monkey," and then "Russian dog" for precedent's sake. Throw in a handful more mammals and we're golden. I don't think "goat" would make my top 15 though, much less rank as core crew. 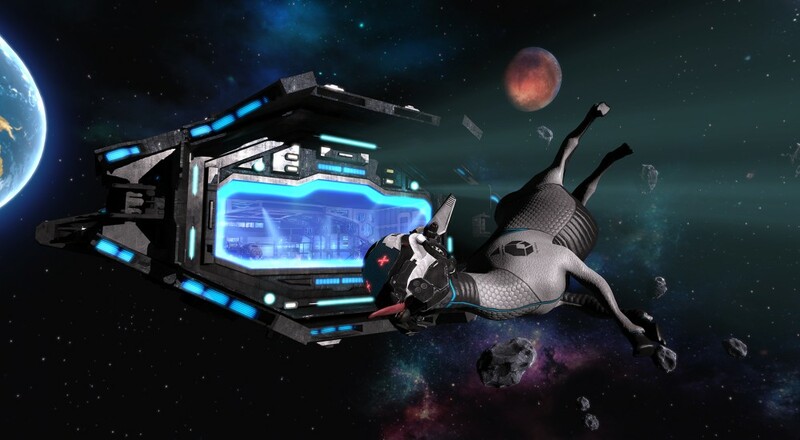 The weirdos down at Coffee Stain Studios aim to prove that goats are quality spacefarers in their third content DLC for Goat Simulator, "Waste of Space." In it, you and your local co-op friend of choice play as goats, assaulting and harassing the citizens of space into crowdfunding your personal ambitions. "Waste of Space" gives you more physics based nonsense for $4.99. This hits a year after the "GoatZ" DLC where our four-legged friends landed in a dumber than normal zombie world, and five months after "Goat Simulator: PAYDAY," in which various animals try to rob banks. After the undead apocalypse and enlisting in organized crime, the only logical place to go is space. While "PAYDAY" and "GoatZ" parodied two specific games, "Waste of Space" seems to blend some real life idiocy with influences from Star Wars and Mass Effect. It's also the biggest Goat Simulator map yet, so if you were just dying for more unbelievably stupid shenanigans, here you go! I don't even think "unbelievably stupid" is an insult here. That might be high praise for the likes of Goat Simulator. Page created in 0.9680 seconds.